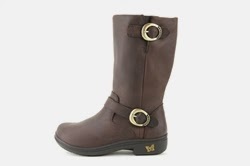 Podiatrist Recommended Women’s Alegria Boots for Winter 2014. Great Boots for All Day Comfort. I appologize for my ‘radio silence’ but between our annual vacation which was followed by one week of jet lag and two weeks of a wicked cold and then the Holidays, I have gotten behind. The good news is that our vacation gave me a chance to test the Alegria boots. My husband and I went to Paris with three dear friends and, fueled by cheese, bread and red wine, we walked (and ate) our way through 10-12 miles of Parisian streeets on a daily basis. If there was something to climb (Notre Dame, The Arc d’Triumph, The Catacombs, The Metro stairs) we did it all! I would have never guessed that Paris had so many stairs. There were some days that, by the end of the day, by the time we got back to the hotel – I was so tired I was staggering – but my feet never hurt! I wore the Alegria Raina on our eleven day walking trip of Paris. I wanted a boot that would keep me warm and dry but be comfortable for long days of walking cold city streets and standing on unforgiving museum floors. The sole is thick and rigid and I added a dress custom-molded insert for superior arch support. I highly recommend this boot and, although it wasn’t nearly as fashionable as the other Parisian women’s boots, I was able to walk all day long with no pain. About halfway through the trip I asked my husband what he thought of my boots and he replied, “I’m not sure what to think.” When questioned further he said, “Well, they’re shiny so they look classy – but they look different.” I have to agree with him that the wide toebox does make them look different – but they were just too darned comfortable and kept me walking in comfort all day and into the Parisian night. Plus, I got them on 6pm.com for $29! 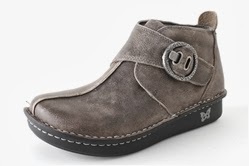 Overall, this is a great boot and if you add a custom-molded dress orthotic on top of the insole that comes with the boot, it will maximize comfort. 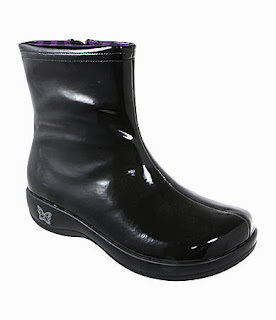 This is also a light boot which decreases leg fatigue and ‘tired leg syndrome’. I hope this was helpful and I am working on a top ten boot list which I hope to have on the blog in the next week so that we can all take advantage of some post-Christmas boot sales.